← Why Are the News Media Ignoring Evan Falchuk? Your humble Made Yankee Fan in Boston has had his ups and downs over the past 40 years, but this just might be the downest. As Henry II might say, Who will A-Rid me of this turbulent/troublesome/ meddlesome/ damned pest? 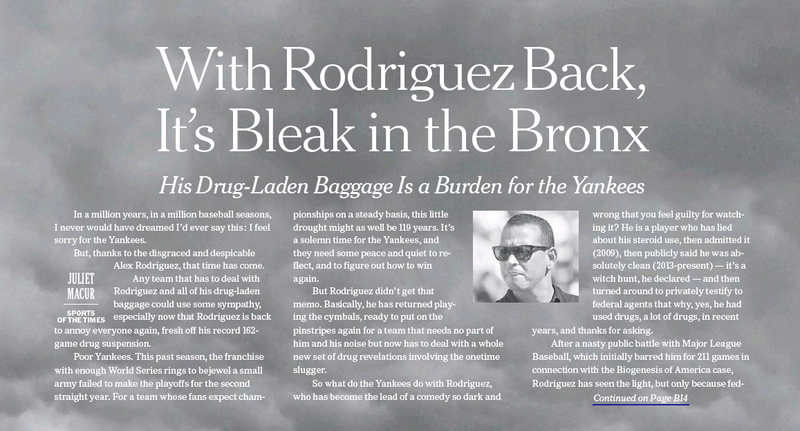 Especially the gutless Yankee GM Brian Cashman, who didn’t bench Rodriguez the way he should have when this whole sordid affair surfaced last year. A sad day for the pinstripes. This entry was posted in Uncategorized and tagged 2004 ALCS, Alex Rodriguez, Brian Cashman, Bucky Dent, Henry II, Made Yankee Fan in Boston, New York Times, New York Yankees. Bookmark the permalink.